If you enjoy tea made from loose tea leaves, that doesn’t mean you are stuck using a boring teaball. 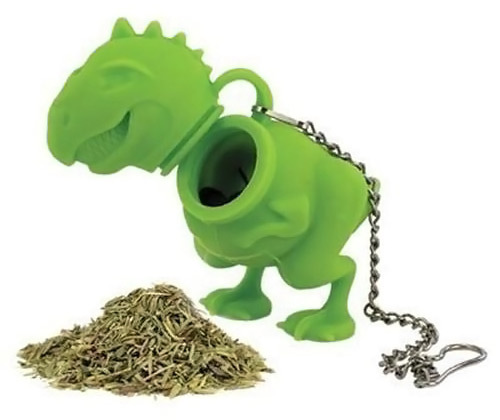 You can steep you tea in style, geek-style, with the Tea Rex Dinosaur Shaped Tea Infuser. This tyrannosaurus rex shaped tea infuser stands about 2.5 inches tall and is made of food-safe silicone, so you don’t have to worry about flavor contamination or anything like that. Combine it with the Mr. Tea Mug for more tea pun fun. The adorable Tyrannosaurus Rex was created by toy inventor Never Ben and his team, and though Boomer is just a prototype, he can already sit and speak on command, and react to "food" by chomping down. Boomer also expresses some basic emotions, He is generally pretty friendly, but you probably shouldn't pull on his tail because it makes him mad. Watch the video above to see all Boomer's reactions and functions. It's pretty impressive, and we are seriously hoping Boomer will be in stores by next Christmas. See if you can figure this one out, dino sleuths. 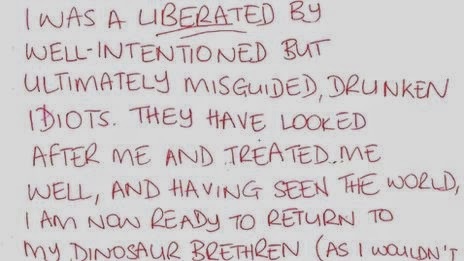 A stolen baby dinosaur model has been returned anonymously to a shopping centre with a note saying the thieves were "drunken idiots". 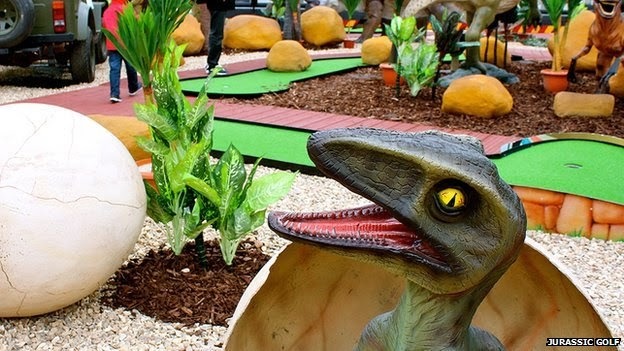 The velociraptor, part of a mini golf game at the Oracle in Reading, called himself Nigel in the note. "Having seen the world, I am now ready to return to my dinosaur brethren," he continued. He sparked a nationwide search in newspapers, and the Twitter hashtag #lostdinosaur was used 58,000 times. A new paper published in the Journal of Vertebrate Paleontology describes 30 Jurassic creatures – five salamanders, one anuran, two lizards, 13 pterosaurs, five dinosaurs, and four mammals – of the so-called Daohugou Biota, a fossil assemblage named after a village near one of the major localities in Inner Mongolia, China. A nearly complete Tyrannosaurus Rex arrived in Washington this week for its new home at the Smithsonian dinosaur hall. 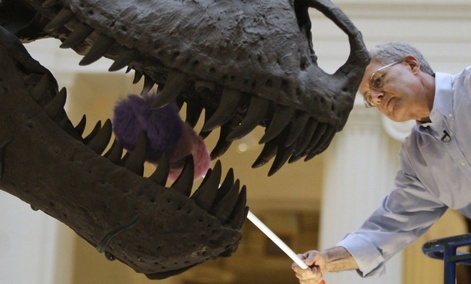 It is being dubbed the "Nation’s T. Rex," and a grand ceremony was held to welcome the old dinosaur to its new home in D.C.
Kathy and Tom Wankel first discovered a three-inch protrusion of the bone in 1988, leading to the dinosaur discovery. See which bone was the first to be un-crated by officials as the nation’s T. Rex arrived in Washington. You don't have to hunt, but you have to keep moving. Do you like chase scenes? About 112 million years ago, a long-necked sauropod dinosaur traversed some intertidal flats near what is now Glen Rose, Texas. Coming after it — perhaps hours or days later, or perhaps hot on its tail in a dinosaur chase scene — a meat-eating theropod followed, overlaying some of the sauropod's footprints with its own. This snippet of the Cretaceous ended up frozen in rock, and paleontologists discovered the prints as early as 1917. But an excavation in 1940 led to a third of the trackway vanishing. Now, researchers have reconstructed the entire trackway, all 148 feet (45 meters) of it, using old photography and new technology. "It's great to get so many stride lengths, so many depths and impressions," said study researcher Peter Falkingham, a research fellow at Royal Veterinary College in London. "There's all this data you can get from an animal moving over quite a long distance." Once Again, Your Dinosaurs Are Wrong. AMNH opens their Pterosaur show this weekend! A museum exhibit highlights new knowledge about the strange, magnificent reptiles. Pterosaurs were the most magnificent fliers of all time. With wings of skin stretched over bone, they soared over the heads of dinosaurs below. Their ranks included fuzzy little flappers the size of a bat and enormous soaring species with 33-foot (10-meter) wingspans that stood on the ground as tall as a giraffe. Paleontologists have known about the existence of pterosaurs since the early days of fossil investigation, but researchers are just now getting to know these extinct fliers. The reptiles are also gaining more attention from the general public. Pterosaurs are often put on exhibit as the "also rans" of the Mesozoic era, presented as window dressing in a world ruled by other, more famous creatures like Tyrannosaurus rex. But this weekend they will fly into the spotlight in the new American Museum of Natural History exhibit "Pterosaur: Flight in the Age of Dinosaurs." A Wine-O-Saur is unfortunately not a booze drinking dinosaur that your teacher neglected to mention to you. 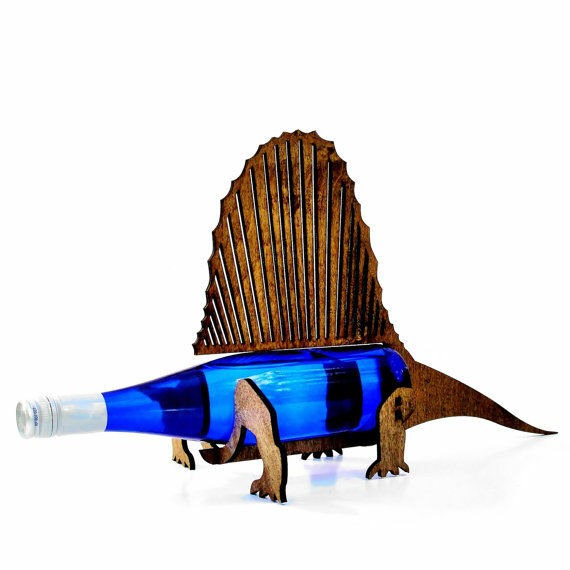 Rather, Wine-O-Saurs are wine bottle holders, cleverly designed in the shape of dinosaurs.